This chapter presents a global perspective on the impacts of climate change and sea-level rise on coastal and adjoining low-lying areas, with an emphasis on post-2000 insights. Here, coastal systems are considered as the interacting low-lying areas and shallow coastal waters, including their human components (Figure 6.1). 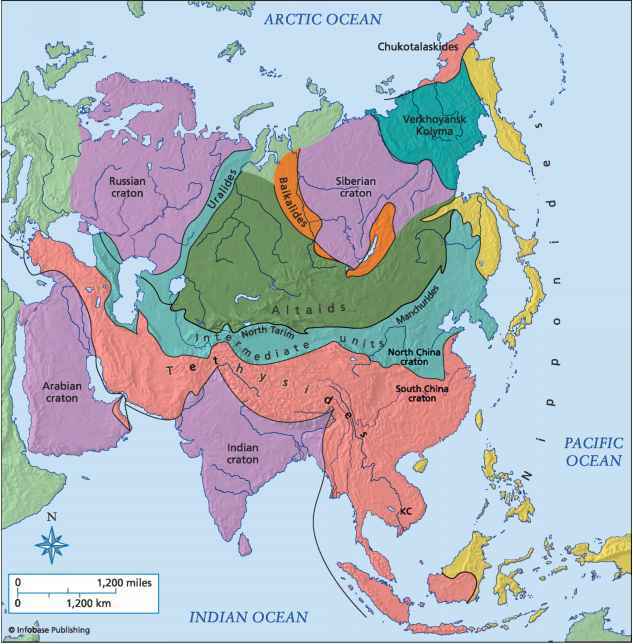 This includes adjoining coastal lowlands, which have often developed through sedimentation during the Holocene (past 10,000 years), but excludes the continental shelf and ocean margins (for marine ecosystems see Chapter 4). Inland seas are not covered, except as analogues. In addition to local drivers and interactions, coasts are subject to external events that pose a hazard to human activities and may compromise the natural functioning of coastal systems (Figure 6.1). Terrestrial-sourced hazards include river floods and inputs of sediment or pollutants; marine-sourced hazards include storm surges, energetic swell and tsunamis. Figure 6.1. 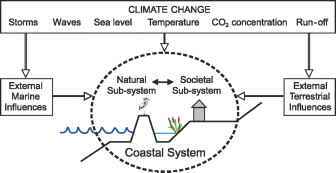 Climate change and the coastal system showing the major climate change factors, including external marine and terrestrial influences. and decreasing the resilience of coastal systems. Integrated assessment and management of coastal systems, together with a better understanding of their interaction with socio-economic and cultural development, were presented in the TAR as important components of successful adaptation to climate change. This chapter builds on and develops these insights in the TAR by considering the emerging knowledge concerning impacts and adaptation to climate change in coastal areas across a wider spectrum of climate change drivers and from local to global scales. Nonetheless, the issue of sea-level rise still dominates the literature on coastal areas and climate change. This chapter includes an assessment of current sensitivity and vulnerability, the key changes that coastal systems may undergo in response to climate and sea-level change, including costs and other socio-economic aspects, the potential for adaptation, and the implications for sustainable development. Given that there are strong interactions both within and between the natural and human sub-systems in the coastal system (Figure 6.1), this chapter takes an integrated perspective of the coastal zone and its management, insofar as the published literature permits.